With growing evidence that some chemicals found in food colorings, preservatives, and packaging materials may harm children's health, a new American Academy of Pediatrics (AAP) policy statement calls for urgently needed reforms to the U.S. food additive regulatory process. According to the statement in the August 2018 Pediatrics, "Food Additives and Child Health", some currently allowed chemicals may best be avoided--especially for children. An Increasing number of studies suggest some food additives can interfere with a child's hormones, growth, and development, according to the policy statement and accompanying technical report. Some may also increase the risk of childhood obesity, rates of which have tripled since the 1970s. The United States allows the use of more than 10,000 additives to preserve, package, or modify the taste, appearance, texture, or nutrients in foods. Many were grandfathered in for approval during the 1950s, and roughly 1,000 additives are used under a "Generally Recognized as Safe" designation process that doesn't require U.S. Food and Drug Administration (FDA) approval. "There are critical weaknesses in the current food additives regulatory process, which doesn't do enough to ensure all chemicals added to foods are safe enough to be part of a family's diet," said Dr. Leonardo Trasande, MD, MPP, FAAP, an AAP Council on Environmental Health member and lead author of the policy statement. "As pediatricians, we're especially concerned about significant gaps in data about the health effects of many of these chemicals on infants and children." "Chemicals that affect the endocrine system, for example, can have lasting effects on a child since hormones coordinate complex functions throughout the body," Dr. Trasande said. "Even small disruptions at key moments during development can have lifelong consequences," he said. Annual estimated health-care costs tied to endocrine disrupting chemicals, he added, are estimated to be roughly $340 billion. Among its recommendations, the AAP calls for a more rigorous and transparent "Generally Recognized as Safe" designation process, including new requirements for toxicity testing before use in the marketplace and re-testing previously approved chemicals. 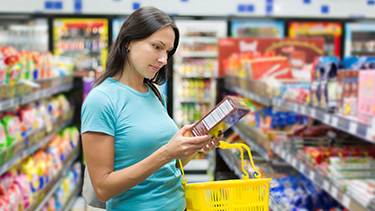 "We need more research to better understand how food additives affect human health," said AAP Council on Environmental Health Chairperson Dr. Jennifer Lowry, MD, FAAP. "Retesting is most important for the chemicals with increasing evidence of risks, but also those with safety data based on outdated testing methods or animal studies." She points to a recent review of nearly 4,000 food additives found that 64 percent of them had had no research showing they were safe for people to eat or drink. Buy and serve more fresh or frozen fruits and vegetables, and fewer processed meats--especially during pregnancy. Since heat can cause plastics to leak BPA and phthalates into food, avoid microwaving food or beverages (including infant formula and pumped human milk) in plastic when possible. Also try to avoid putting plastics in the dishwasher. Avoid plastics with recycling codes 3 (phthalates), 6 (styrene), and 7 (bisphenols) unless they are labeled as "biobased" or "greenware." "Despite a tough political climate, there is an urgent need for decision makers to fix this issue," Dr. Trasande said, "starting by rolling back the presumption of safety for chemicals added to foods."